Diva Devotee: Are You Musically Tone Deaf? Take This Test And Find Out! 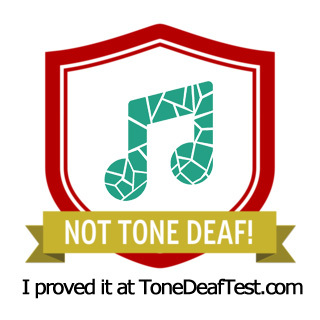 Are You Musically Tone Deaf? Take This Test And Find Out! This is a pretty basic test, so don't expect to be taxed AT ALL. It consists of three parts: the first asking you to judge whether two notes are the same or different; the second asking you to judge whether the notes are sliding up or down; and lastly, you are made to judge if one note is higher or lower than the next. Thank the Lord I scored 100% - anything else and I may have had to question my ability to blog! However, I won't adding this accomplishment to my curriculum vitae anytime soon. I'm sure anyone who isn't tone deaf will score top marks. If you have five minutes to waste, have a pop at it.